Supercharge Your Caesar With World's Best Caesar Additive! Are you looking to add a little more spice to your Caesar or BloodyMary? Need something special that can tickle your crazy taste-bones? Want to heat up your Caesar Sunday or should we say everyday? 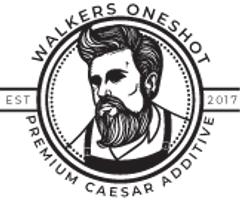 Give a warm welcome to the combo of Clam Juice, vodka (Spirit not always required), combined with Walkers OneShot Premium hand-crafted Caesar additive, stacked with herbs and spices, and all jam packed into a perfect glass of goodness. Awesome, eh? Feel the awesomeness of amped up Canadian Spicy Caesar or Bloody Mary Cocktail and have a perfect taste every time, in no time. It's our zesty, fresh and unmatchable flavor. Available in convenient pack sizes, we have something for everyone. No matter if you love extra spicy goodness or just a mild combo of sweet and salty, we are going to surpass your expectations. Everything we make is exceptional and is going to give you that extra zest you've been craving for. Right from smoked salts, pepper, herbs and more, we select everything carefully to make sure you have that perfect, nice, cold sip of your Bloody Mary or Caesar. All our products come with 100% satisfaction guarantee. If any of our products fail to match your expectations, you will be provided with a 100% Credit towards another one of WALKERS product. So, you have nothing to lose! Buy with confidence! This is the time to kick up your Caesar. If you are a Caesar Crazy, just like us, let's have a perfect shot!